PLEASE BE SURE TO RETURN AT A LATER TIME. THANK YOU. Forensic meteorology is the scientific study of weather, applied to the process of reconstructing weather events for a certain time and location. 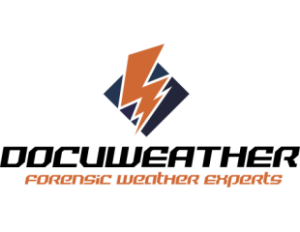 This is done by acquiring and analyzing local weather reports such as surface observations, radar and satellite images, other data, and eyewitness accounts. Other than documenting what the weather conditions were at a particular place and time, what other reasons would I use a Forensic Meteorologist? A Forensic Meteorologist might be utilized to corroborate or invalidate an alibi, provide context for an accident, or even to determine if the conditions could have been reasonably anticipated or were a freak chance event. What are Certified Weather Records? Certified Weather Records are highly recommended if you are presenting data for use as evidence in court. These weather records are obtained from the NCDC in Asheville, North Carolina and contain a blue ribbon and seal, and is the highest form of certification offered and is acceptable in most (if not all) courts. To accurately interpret these weather records, it is strongly recommended to utilize a consulting meteorologist.